In 2010, a small group of BMS passouts gathered together to create a completely new vibrant management (BMS) community portal in Mumbai. So, was born BMS.co.in, No. 1 Bachelors of Management Students Portal – of the BMSites, for the BMSites and by the BMSites. 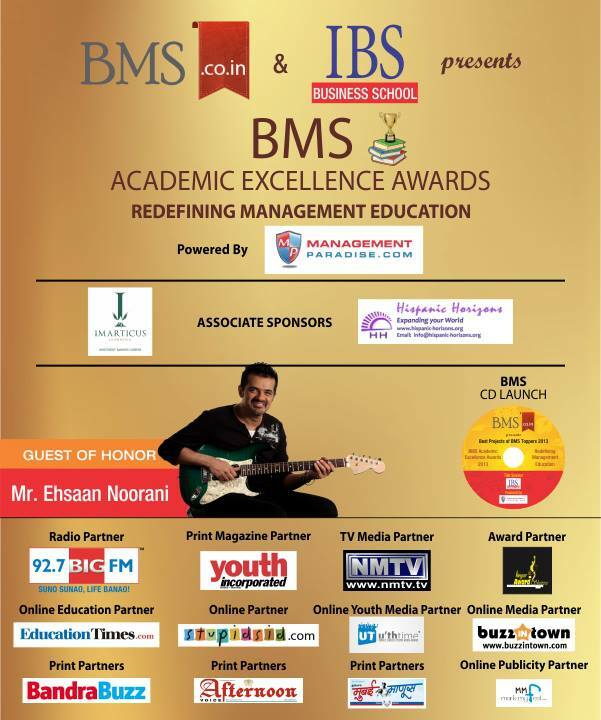 Starting with few passionate BMS grads, BMS.co.in has grown to become India’s Coolest & Largest BMS community which has been featured on various media platforms like Educationtimes.com, Hindustan Times, U’th Time, Bandra Buzz, Afternoon Voice, Buzzintown, DNA, Free Press Journal, etc. BMS.co.in is an initiative that helps BMS students by sharing BMS experiences, tips, advises, interviews of core faculty members, BMS coordinators, Principals and various students. It helps you to understand how BMS all around Mumbai is. It is a family connecting all BMS members from different places around. It aims to revolutionize BMS (Management) Education and support the voice of management students and vision to provide information of “Management Education and Current Trends in BMS”. BMS.co.in covers content on BMS Academics like Exam related queries, best reference books, College Life like College festivals, Industrial visits, Life @BMS, Careers like what to do in BMS and what not to, Business, Entertainment, Fashion, Lifestyle, Health, Trending, Relationships, Travel, Food, Youth Blogs etc, because we believe in helping you develop your overall personality and not just turn into book – worms! 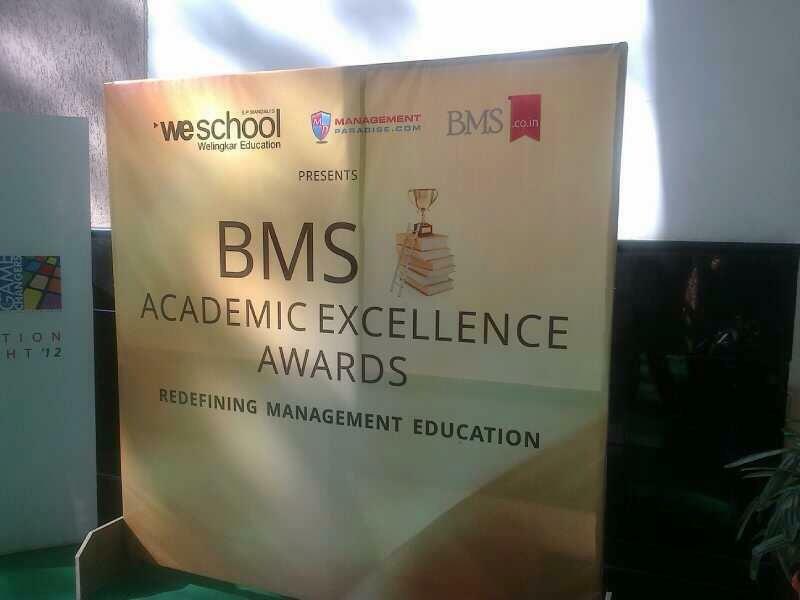 BMS Academic Excellence Awards 2013 – A great success! 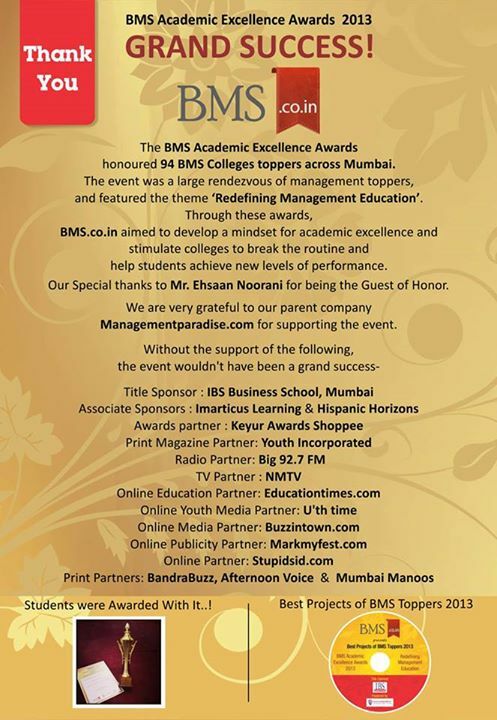 YOUR support makes the BMS.co.in Job Fair 2013 a Grand Success! Who doesn’t like to be felicitated…and that too with an attractive trophy!! Bachelor of Management Studies (BMS) is a 3-year full time degree program introduced by a number of institutes. University of Mumbai has introduced the Bachelor of Management Studies (BMS) from the academic year 1999-2000. The BMS program is spread over 3 years consisting of 6 semesters, leading to a Bachelor Degree of Management Studies. A BMS degree provides adequate basic understanding about management education among the students. Compare to a regular degree, BMS offers more of skill enhancement and practical knowledge besides theoretical understanding through a teaching pedagogy of case studies, projects, industrial visits, presentation, etc which is similar to MBA. BMS graduates have a slight edge over other as they have better exposure and knowledge of the world. A Candidate for being eligible for admission to the Degree Course in Management studies shall have passed XII Std. Examination of the Maharashtra Board of Higher Secondary Education or its equivalent and secured not less than 45% marks in aggregate at first attempt. Every candidate admitted to the degree course in the constituent /affiliated college /recognised institution conducting the course, shall have to register himself /herself with the University. What To Do After BMS? I WANNA KNOW THAT IS INDUSTRIAL VISITS COMPULSORY 4 EVERYONE?ALSO IF YES,WILL THE COST BE INCLUDED IN COLLEGE FEES,OR WE WILL HAVE 2 PAY SEPRARTELY?&IS IT TOO EXPENSIVE?WILL INDUSTRIAL VISITS BE IN ALL 3YRS?WAT WILL BE DURATION OF INDUSTRIAL VISITS?PLZZZZZ REPLY SOON. Yes, Industrial Visits are compulsory. You got to chose btw either 1 day visit or 3-4 days IV. Well, as per my knowledge, a part of the cost of IV would be included in your college fees. You would have to pay the remaining amount. It is not too expensive but it depends on the place your college takes for IV. 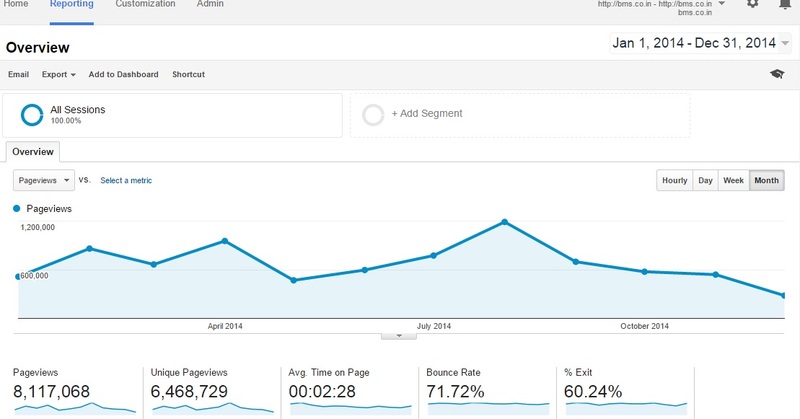 The fees can vary from 3k-5k for long visits. Industrial Visits will be in all 3 years but you have options to go for 1 day or 3-4days. industrial visits are made optional in many colleges. Now it depends on the college if they want to take students for the IV. What will be the fees of all three year and al otr expenses? hope u may b very helpful..
hey ..m in sybms .I got 5.16 GP in 3rd sem..Tht is 60.16 %…. wanted to ask is der any special requirement to b selected for campus interview..and also to pass d interview? I got 54 % in 1st sem and 64%in 2nd sem. ….plzzz reply.! Try to Score above 70% in your third year. And improve your communication skills and understand the concepts instead of ratofying. How ll be the scope after passing out from bms as i had a terrible background of engg?? May I know the Subject toppers of BMS VI Sem 2013-2014. Especialy Retail Management. Hi, our team is still working on it and collecting accurate information from each college. I am an ex bms student studying in canada. I wanted detailed course outline for all the courses to get admission for one of the programs offered in my college. I have scanned almost all the sources online to get the course outline but have failed miserably. It would be of great help and I would really sincerly appreciate if I could get the course outlines for all 6 semesters. University inform your college authorities about the ranks. Can you please share revised paper pattern for Tybms.We found variation in it. Various professor has updated different pattern. I m in ty n will appear fr 6th sem in april 2015 ..i have chosen FMO …but i dont know which books i should refer to study the subject …as the subj is itroduced fr the frst time i have no idea wat ques may come in xam ..plz suggest me the best source or best book to study FMO..In market vipul book is available but our professor is refferring sone odr book n providing us notes of dat book which is quite different frm vipul tb..
Thanx fr ur reply but there isnt any book available of rishabh publication for FMO..is vipul enough to study fmo..
Due to lack of attendance my college is not allowing me to appear for the IV sem exams.. But when I enquired about the additional exams.. They are saying that..nothing can be said right now… But mostly it will b conducted at the end of next year I.e., 2016.. Which means that I’ll have to take a drop for a yr.. And now when I went through the university rules.. I came to know that the colleges are supposed to conduct the additional exams 20 days after the declaration of results for the semester but before 40 days of it.. I don’t know what to do now.. Please give me some suggestions .. Please help me …what I need to do now… I cannot afford to waste one year..
Hi. I am a final year student of BMS from Delhi University. I am exploring my options after BMS. Both for further studies and job. Can you please suggest some options? Dear Kaamil, you can check this link – http://www.bms.co.in/careers-after-bachelors-of-management-studies/ to know the career options after BMS. i m planning to pursue BMS as my course so are there any specific subject requirements to apply for this course…. You need to have 40% marks in your HSC / 12th standard any stream to get into BMS course. which is the best college for dis course..
Can I go for pgdm with tybms ? or any other course with TY? Nope, PGDM courses are “post graduate” courses. You have to graduate out of your third year first before you take up a post graduation course. Hii….I want to know about bms admission process….what all I need and where to submit it….which is the last date for applying. …and can I do it online ?? ?